So first and foremost, my apologies for the prolonged absence on this page. In fact, I’m a day short of 1 year since my last post. Don’t judge me. It’s just that I find microblogging on FB is a lot easier and done from the phone. That said though, I woke up early this morning, eager to tell you all about a new recipe we tried yesterday. Pork belly ‘burnt ends’ Bánh Mì. Its a mouthful to say and write but boy what a mouthful of taste when you bite into one of these succulent Vietnamese style sandwiches. Bánh mì (/ˈbɑːn ˌmiː/ or /ˈbæn ˌmiː/; Vietnamese pronunciation: [ɓǎɲ mî]) is the Vietnamese word for bread. Bread, or more specifically the baguette, was introduced by the French during the colonial period in Vietnam. The bread most commonly found in Vietnamese cuisine is a single-serving baguette that is usually airier than its Western counterpart, with a thinner crust. Unlike the traditional French baguette, the Vietnamese baguette is made with rice flour along with wheat flour (see rice bread). In Vietnamese cuisine, bánh mì is typically made into a sandwich known as bánh mì kẹp or bánh mì Sài Gòn, eaten alongside dishes such as bò kho (a beef stew) and phá lấu, or dipped in condensed milk (see Sữa Ông Thọ). In the Western Hemisphere, especially in areas with substantial Vietnamese expatriate communities, the term bánh mì is used as a synecdoche for the sandwich, which is sold in Vietnamese bakeries. This recipe hit my inbox about a week ago from our good friends over at Amazingribs.com. When I saw it, I said to Heather, this is a MUST DO and a MUST BLOG type of dish. Well, I wasn’t far off! Here’s what you’ll need to make a simple but killer dish for your family and friends. Start by trimming off all the skin from your pork belly. I got mine at NTUC Fair Price in Boon Lay and it was about $4.90 for a packet of 4-5 slices. Save the skin and fry it up later to make some pork crackling…goes great with a cold beer on a hot day. Once you’ve taken the skin off, trim the pieces to make 1.5″ cubes, If you’re dealing with a whole belly, take a sharp knife and carefully cube it all up. Mix the rub together and coat your pork belly cubes liberally. You don’t need to oil them but do get them a bit wet with a bit of water. The rub will stick better. Once coated, place the cubes onto a rack and get them ready for smoking. Set up your smoker (or grill) for indirect heat at 225F (about 107C). Just before you’re ready to smoke, chuck on about two fist-fulls of wood. I used plumb this time around and it’s subtlety was amazing! Now place your pork belly onto the smoker and set your timer for an hour. Once it pings, simply rotate the rack and let it smoke for one more hour. In the meantime you can prepare your sauce and put it in the fridge. You can also make the glaze and leave that covered at room temperature. The quick pickled vegetables are super simple to make and taste amazing with the pork belly burnt ends. Simply julienne the carrot and radish and thinly slice up the red onion. In a medium pan, bring the water, vinegar, salt and sugar to a boil. Once done, take it off the heat and place the vegetables into the pot, cover it and let it steep for 30 minutes. Let it cool and transfer the veg to a bowl and refrigerate. So, two hours have gone by now. 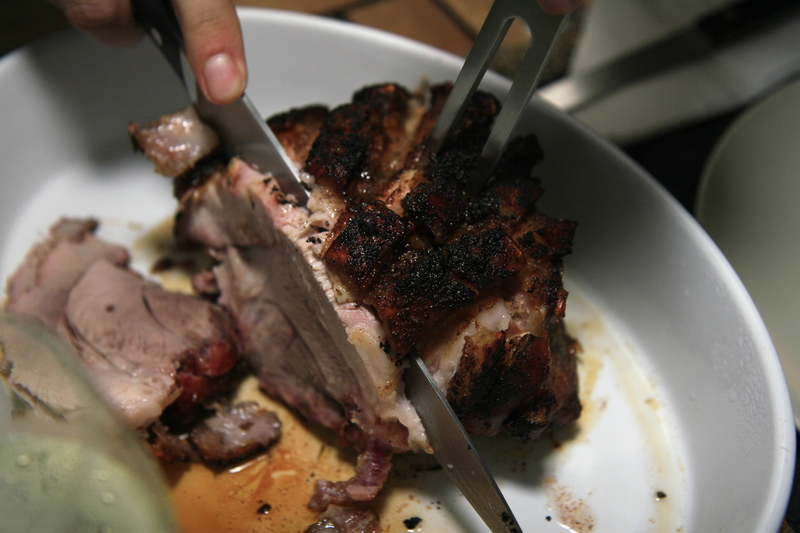 Carefully remove the rack containing all the pork belly cubes and transfer them to a dutch oven or a aluminium tray. I love to use my cast iron gear when I can and I prefer it to wasting alumimium trays. Pour the glaze all over the pork belly cubes and make sure you coat them thoroughly. Give them a good stir. I then put an extra two layers of aluminium foil over the dutch oven followed by the lid. Let that steep for 90 minutes. So now the pork belly cubes are starting to look more like burnt ends. One last step but it’s a tricky one is to crisp up the cubes. Take the dutch oven off the grill and set up for direct heat but use grill grates if you have them. They are essential when doing work like this because you’ll never lose a piece of belly to the roaring flames below. Trust me, you want every scrap of pork. Remove the cubes from the dutch oven but keep all that amazing glaze in there. You’ll drop the cubes back in once they’re crispy. 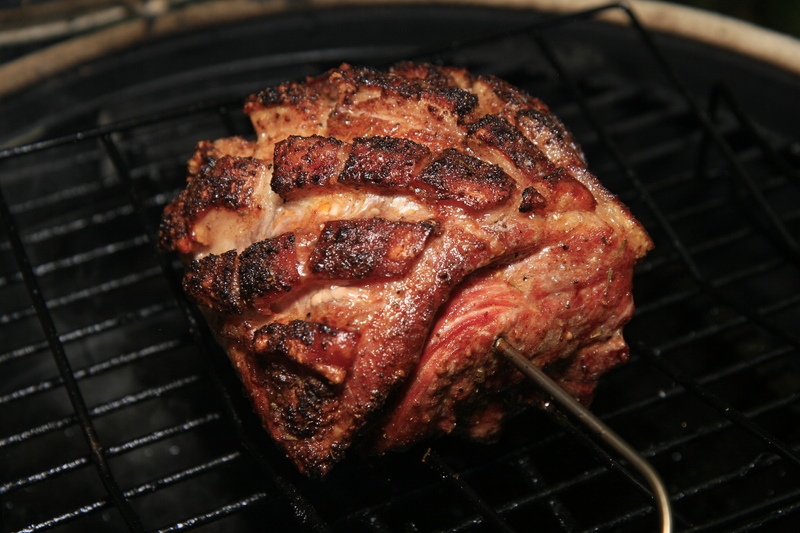 Once you’ve got a hot grill ready, place the cubes on top and keep the dome of your grill open. Move the cubes around for about 15 minutes ensuring you don’t burn them. All that hard work could easily go to waste if you’re not careful here. Once crispy, put the cubes back into the glaze and give them a final coating. Slice your baguette lengthwise leaving a hinge. Smear the mayo-sauce then load of some shredded cabbage, cucumber slices and the pickled vegetables. Now load up your pork belly burnt ends and sprinkle with chopped cilantro and jalapeno peppers. Prepare to be amazed! Bite into that sandwich and you’ll experience and explosion of flavour that has no equal. Enjoy this great recipe and please let me know how you get on with it. An Egg-straordinary opportunity to Egg-sperience the Egg-citing recipes that Roman and Heather try on the best grill in Singapore (probably one of a tiny few Big Green Eggs in Singapore!) Apologies for all the Egg puns… Clearly we don't mean to be Egg-scruciating!!! Veggie Burgers – Who Knew?